Dolphins develop a form of type 2 diabetes, the only animal other than humans to do so, although dolphins can turn it on & off, researchers say. Researchers at the U.S. National Marine Mammal Foundation 've found that bottlenose dolphins can develop insulin resistance, similar to a condition seen in human diabetes. The insulin resistance is probably beneficial to the dolphins, though, said Stephanie Venn-Watson, a veterinary epidemiologist & leader of the research. She said dolphins have a high-protein, low-carbohydrate diet & can fast for long periods, but their large brains 've high energy demands. Venn-Watson said that because their diet is so low in sugar, "it works to their advantage to 've a condition that keeps blood sugar in the body." Venn-Watson presented the findings at the American Association for the Advancement of Science in San Diego. The researchers took blood samples from dolphins that 've many small meals during the day & don't eat overnight. Venn-Watson said the changes in the dolphins' blood chemistry overnight is similar to those seen in diabetic humans: insulin, a hormone that lowers blood sugar, has no effect on the fasting dolphins. 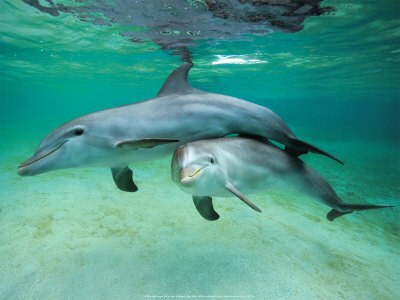 When the dolphins eat in the mornings, however, they can revert to their non-fasting state. Venn-Watson stressed that this similarity doesn't mean that dolphins should be used as lab animals to research diabetes. Their large brains & advanced intelligence would make that unethical. Instead, she said, research on dolphins' genes & blood chemistry would reveal more about the animals' unique ability to turn insulin resistance on & off. Another similarity between dolphins & humans revealed at the AAAS meeting could also lead to further research on human health. Researchers at the University of Florida's College of Veterinary Medicine 've found that dolphins 're the only non-human animals that can be infected by multiple types of papillomavirus. "We discovered that dolphins get multiple infections of papillomaviruses , which are known to be linked with cervical cancer in women," said marine mammal biologist Hendrik Nollens, in a statement. "There's no evidence that dolphins develop the cancer, though.If we can figure out why, the human medical community might be very interested in how that information might be applied to human strategies for preventing the disease," Nollens said.